Big plans: A view of the civic plaza, showing a stage area, outdoor dining and a giant video screen. 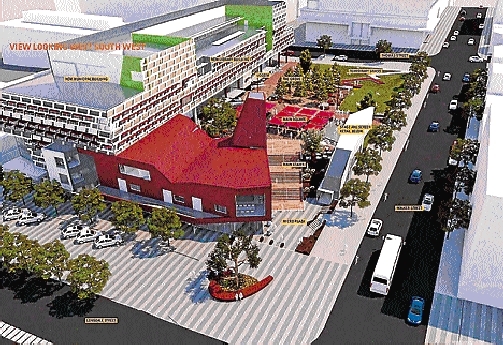 FIRST pictures of Greater Dandenong’s planned civic centre, council offices, library and plaza have revealed the council’s desire for a “Federation Square of the south-east”. The designs, released last week, show an eye-catching sandstone complex on the corners of Lonsdale, Walker and Thomas streets. It includes an events stage and a yet-to-be-funded giant video screen. Site demolition is set to start in July, with project completion expected in March 2014.